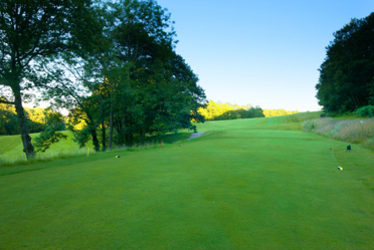 A dog-leg left to right hole, where the tee shot is hit over the brow of the hill onto a sloping fairway. Everything tends to kick left down the slope and collect toward the bottom of the hill so the key to the hole is “how much you dare to try and cut off the corner”. Be conservative and you have a straightforward but longish second shot across the valley. Take a bit of a risk and you are rewarded with a short pitch, sharply uphill, into a deceptively long green defended by bunkers left and right.